The Rosette, LLP American Indian Economic Program and the Indian Legal Program is pleased to be hosting its Third Annual Tribal Government E-Commerce Conference, “Sovereignty and E-Commerce: Innovating and Reshaping the Borders of Indian Country CLE Conference” at the Wild Horse Pass Hotel & Casino, February 2-3, 2017. Registration is now open! Register Early and save! Space is limited! Click here for conference website. Fredericks Peebles & Morgan LLP (FPM) is a nationwide law firm dedicated to the representation of American Indian tribes and organizations. We represent tribes and tribal entities in a wide spectrum of services including tribal corporate affairs, business transactions, litigation, gaming, and tribal governmental affairs. FPM is seeking an associate attorney to join our team in Omaha, NE. Candidates must possess at least two-three years post-J.D. attorney experience. Incisive analytical ability, as well as excellent research, writing, and communication skills are also required. Candidates must work well independently and as a team member in a fast paced environment. A background in tribal and Federal Indian law and experience working in Indian Country is also strongly preferred. Prior judicial clerkship, litigation, or business transactional experience is a plus. Your contributions are rewarded with a “Total Compensation” Package including a competitive salary, bonus potential, and excellent benefits. Position is open until November 20, 2016. Legal Aid Services of Oregon (LASO) seeks a Staff Attorney for its Native American Program (NAPOLS), which is located in Portland. LASO is a non-profit organization that represents low-income clients in civil cases. LASO’s eight regional offices serve the general low-income population throughout the state and two specialized statewide programs provide services to farmworkers and representation on Native American issues. LASO is an effective, high-quality legal services program committed to advocacy strategies that will have a demonstrable effect on community problems. NAPOLS assists income-eligible Indian tribes, Native organizations, and individual tribal members, including with cases related to tribal sovereignty and self-governance, estate planning and trust resources, access to benefits, expungement of criminal records, and tribal court cases. NAPOLS also offers community education on a wide range of legal issues. The staff attorney will be responsible for maintaining a varied caseload providing legal services to Indian tribes, Native organizations, and individual tribal members. Position requires current Oregon State Bar membership, proven interest in and commitment to working in Indian Country, and knowledge of federal, tribal, and state laws impacting tribes and tribal members. Regular travel throughout Oregon, including some overnight travel, is required. Salary is based on experience, within a statewide salary scale. Full Benefits including health and dental insurance and retirement plan. Legal Aid Service of Oregon is an Equal Opportunity Employer. Tribal members and minority applicants are encouraged to apply. Closing Date: Friday, October 28, 2016 at 5:00 p.m. Minimum Qualifications: Juris Doctorate degree from an ABA accredited university. Experience equivalent to three years full time work providing legal counsel in a tribal, local government, or corporate setting, at least one year of which involved trial work and supervisory experience. Must be licensed to practice law in the State of Arizona. Must possess a valid Arizona driver’s license and be able to meet the Community’s insurance carrier requirements (see list attached to application or on website). Must successfully pass a background check. Preferred Applicant Qualifications: Possess or be willing to obtain Special Assistant U.S. Attorney (SAUSA) Certification. Possess knowledge and experience interfacing with Federal agencies and have the ability to work within prosecutorial processes coordinating with Federal agencies and the Ak-Chin Indian Community. Lunch Lecture with Kevin Washburn – Next week! 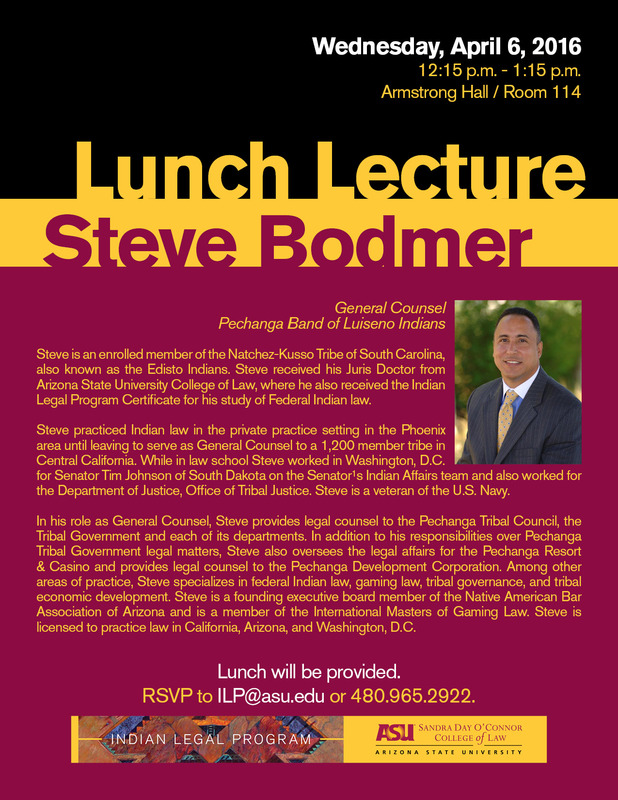 Oct 19 (12:15pm) in Room 250, Beus Center for Law and Society at Downtown Phoenix campus. The Protective Services Attorney provides support in child welfare, juvenile and adult in need of care litigation on behalf of and representation for the Gila River Indian Community (Community) and Tribal Social Services (TSS). Provide counsel and advice to TSS on substantive issues related to child welfare. Draft, review various legal pleadings, motions, discovery, documents, and correspondence necessary to litigate Child In Need of Care, Juvenile Offender, and Status Offender matters; in the Community Court for Adult in Need of Care matters; and in state court child custody proceedings, as defined in the Indian Child Welfare Act, 25 U.S.C. § 1901 et seq (1978), involving children who are enrolled or eligible for enrollment in the Community. Prepare for and attend hearings, staffings, and trials related to litigation and casework. Conduct legal research, analysis and document production related to the litigation. Assist with the development and maintenance of case files, calendars and databases. Comply with tribal, state, and federal governmental regulations; maintaining an ethical practice in respect to the Community, Tribal Courts, judicial system and clients. The Supervising Protective Services Attorney provides litigation support and representation for child welfare, dependency, juvenile and adult in need of care matters on behalf of the Gila River Indian Community (Community). This position provides support in the more complex cases and oversight of the Protective Services Attorney’s and support staff; providing effective, vigorous and compassionate legal services. Perform professional and managerial work directing the operations of the Protective Services Office; demonstrating continuous effort to improve operations, decrease turnaround times, streamline work processes, and work cooperatively to provide quality customer service. Supervise and provide leadership and direction to Protective Service Attorneys and support staff. Conduct legal research, analysis, and document production related to the litigation. Prepare and present budgets and reports to the Community, Committees, Council and Executive Office. Oversee the development and maintenance of case files, calendars and databases. Navajo Nation Law CLE Conference – Early Registration ends today! Navajo Nation Law CLE Conference will be held on Friday, October 28, 2016 at the Beus Center for Law and Society located at ASU Downtown Phoenix campus. Early Registration ends today at 5pm! This event will be held on Sunday, October 9, 2016 (3:30-5 pm) in the Steele Auditorium of the Heard Museum. This event is hosted by the Heard in partnership with the Native American Rights Fund and the Indian Legal Program at the Sandra Day O’Connor College of Law at Arizona State University. Hear a panel of cutting-edge American Indian artists and leading lawyers discuss the ways Indian Identity and artist vision can shape and challenge American Indian identity while also having legal implications and community impact. Brett Shelton (Oglala Sioux Tribe), artist and staff attorney with the Native American Rights Fund. Gregg Deal (Pyramid Lake Paiute) As a provocative contemporary artist/activist and 15-year resident of the Washington, D.C., metro area, much of Gregg’s work deals with indigenous identity and pop-culture, touching on issues of race relations, historical consideration and stereotype. Matika Wilbur (Swinomish/Tulalip) is an unique artist and social documentarian in Indian Country. She is founder of Project 562 which explores Native identity and experience through a dedication to photographing contemporary Native America. Free and open to the public. RSVP is required here. Under direction of the General Counsel, the Associate General Counsel for the Agua Caliente Band of Cahuilla Indians (“Tribe”) is responsible for providing legal advice to the Tribal Council, Administration, Departments, and Committees regarding a wide array of tribal legal matters. The Associate General Counsel position will be integral to the growth of the Tribe’s legal department and ideally will have an increasing focus on one or more of the following matters: tribal taxation, tribal labor and employment, general commercial contracting, and other transactional matters as may be assigned. For application and full job description, click here.